New Delhi, India (CNN) -- An Indian military jet crashed during an air show in southern India Wednesday, killing the pilots and injuring two civilians on the ground, authorities said. The pilot and co-pilot died in the crash of the Kiran MK-II, according to Murli Krishna, a deputy police commissioner. Indian navy chief Nirmal Verma told reporters that the pilot and the co-pilot probably avoided ejection in a bid to minimize damage on the ground. 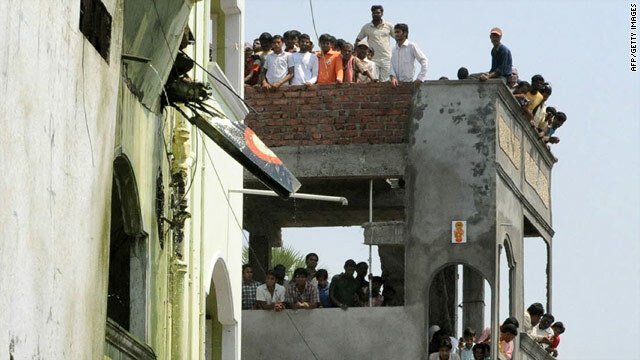 The plane hit a three-story building in a residential area near Begumpet Airport in Hyderabad, injuring two civilians, he said. The plane was flying as part of a four-plane formation by a Navy aerobatics team when it went down.